Breaking news: Apple TV is flying the nest, with a dedicated Apple TV app coming to a wide range of smart TVs – as well as set top boxes and streaming sticks from rival companies like Roku and Amazon. We learnt back in January (at CES 2019) that the Apple TV app was coming to a number of smart TVs – in ranges by Samsung, Sony, LG and Vizeo – beyond Apple's own set top box and streaming player, the Apple TV. 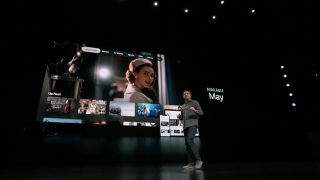 Apple gave us a gentle reminder at its March 25 ShowTime event, along with news that the Apple TV app would be landing on Amazon Fire TV and Roku streaming devices. Moving the app onto rival devices is a risky one, as it decentivizes consumers from buying into Apple TV hardware – and both Fire TV and Roku ranges feature 4K models in the vein of the Apple TV 4K. But it certainly gives Apple a wider potential audience – especially with its new Apple TV+ streaming service, and Apple TV Channels subscription option for bringing various channels and platforms (everything except Netflix, basically) into one place. So if Apple risks splitting its revenue, it's clearly of the mind that its new subscription options will pay for themselves.